On the last day of Food Tech Week London, The Hoxton, Shoreditch was the coolest place to be and be seen. Foodies, vloggers, and food tech enthusiasts filled the premise eager to see a live food demo of Jamie Oliver’s Food Tube show hosted by John Quilter, AKA the Food Busker. Guests were escorted to ‘The Apartment’ – a versatile loft-style entertainment area in the heart of the hotel. The Manhattan styled space is divided into a series of elegant rooms including The Library, Living Room, Red Study, Black Study, Dining Room and Playroom. 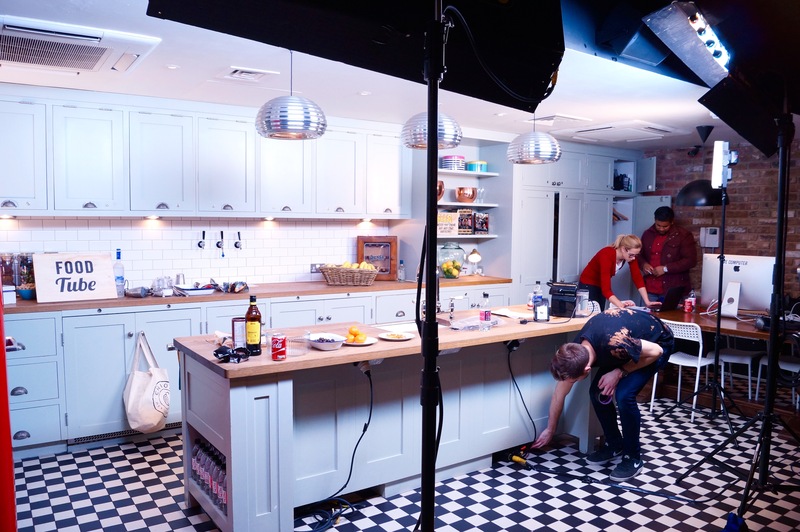 But most of the action was to take place in the Pantry Kitchen with its checkerboard flooring, teal cupboards and long wooden worktop. 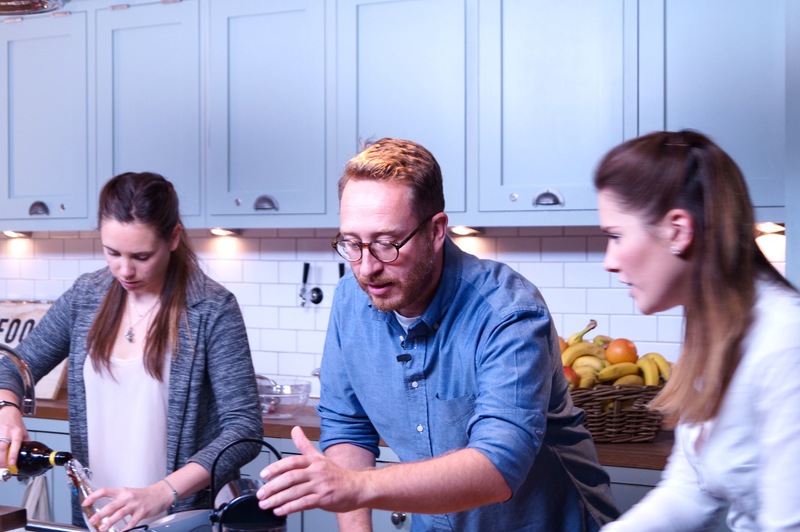 Before the cooking demonstration began, a panel discussion was held in the Living Room with Richard Herd – Food Tube Network Manager, and Lisa Tookey – Commercial Director of the Jamie Oliver Media Group. Richard’s first job was as a runner on The Naked Chef with Jamie. 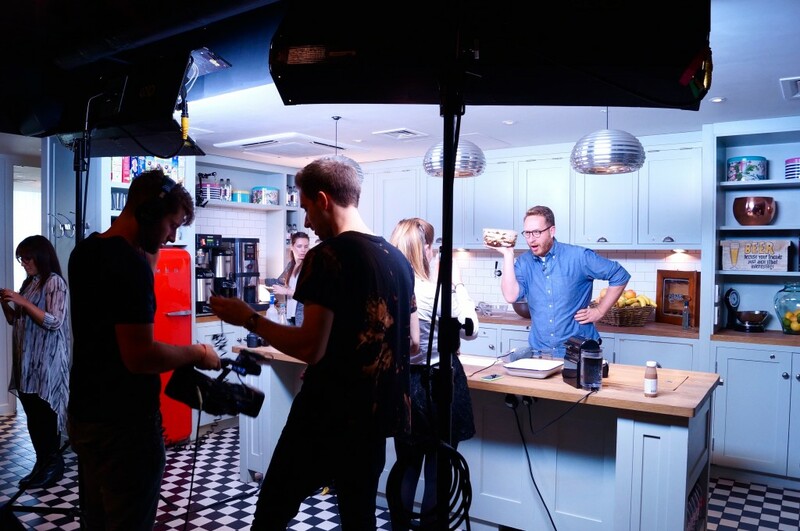 After 15 years working in TV he returned to Fresh One Productions (a Jamie Oliver Media Group Company) to head up Jamie’s Food Tube Channel and network on You Tube. He now runs a team of rebel foodie filmmakers helping to curate recipes, content, and personalities for Food Tube subscribers to feast upon. 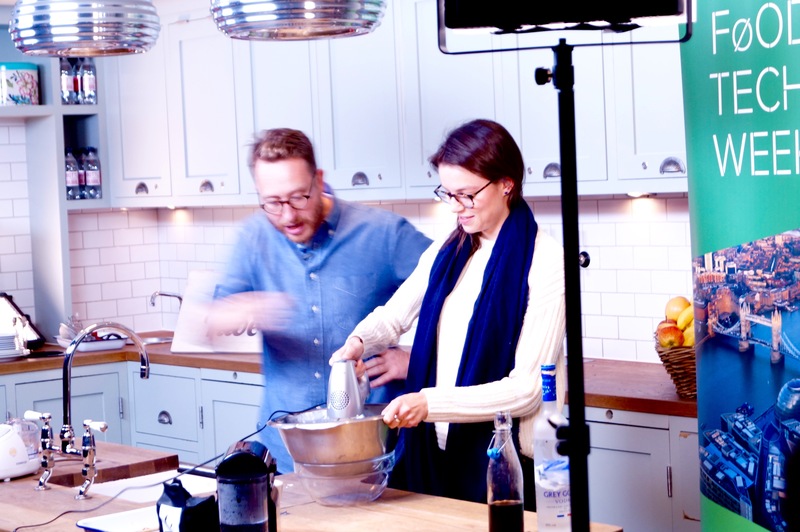 Featuring Oliver at the forefront, the channel (which has won two Webby Awards for Best How-to DIY Channel and Best Lifestyle app), has been met with great acclaim. The channel launched on the 21st of January 2014 and hit 100,000 subscribers on the opening night. Initially, Food Tube was Jamie Oliver’s personal YouTube channel, with a moderate amount of subscribers and infrequent updates. But, after seeing a need among their audience for more than just weekly content, Herd and Oliver realized YouTube could be more – a real opportunity to create open dialogue with his audience. However YouTube is very different from TV, and Herd and Oliver had to relearn the ropes to “grain the trust of a new digital millennial audience,” says Herd. Food Tube has become a shelf space for fresh talent, and an opportunity to showcase great characters that wouldn’t necessarily fit on TV. It is a lot more immediate as a platform and the team learned that they had to get to the cooking part straight away. “The two most important words on YouTube are ‘How To’… There will be an audience for what you do…if you can make engaging and interesting content that has a bit of an edge,” says Herd. Quilter adds, “Frequency and consistency are the most important thing… quality can be improved later in terms of production value.” It is all about risk taking and asking your audience questions. YouTube is an amazing platform to have this open dialogue and get direct feedback. You can then work on your act until you find the right message that your audience appreciates. Speaking on the commercial side of things Lisa Tookey says that investing in YouTube is a good idea. “Take 5% out of your TV budget and put it into your YouTube channel,” she advocates. “There are young audiences aged 13 to 17 who are no longer watching TV, they are watching online and they need to be engaged with. If you don’t respond to their behaviour you will be losing a large part of your audience,” she adds. 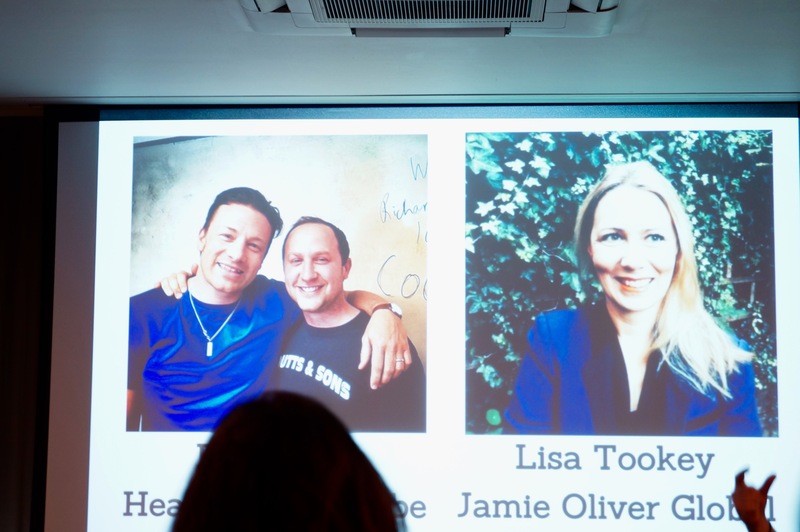 Lisa leads the commercial team for Jamie Oliver Media. She has over 20 years of experience creating commercial partnerships in lifestyle, fashion and beauty for magazines like Grazia and Red. She is the mother of three, and made the transition into food two years ago when she was phoned by a headhunter asking if she would be interested in the Jamie Oliver role. 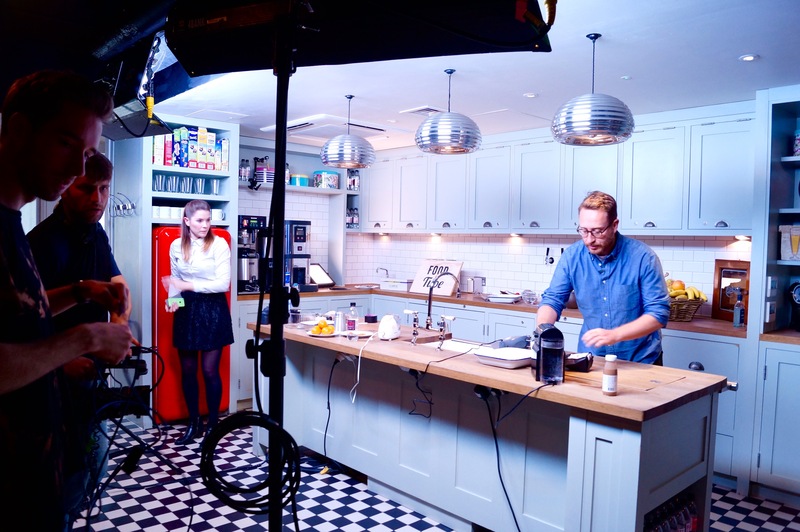 Now she works on growing the Jamie Oliver revenue streams, which are media led including Food Tube, the Jamie Oliver magazine, website and cooking shows. “There is only one Jamie – we need to make sure his values and mission are spread across all those different platforms globally,” she says. 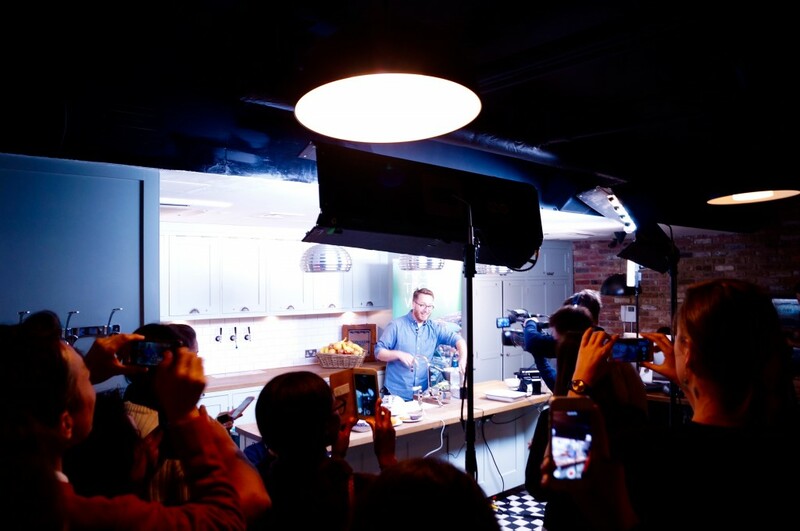 After the Q&A it was over to the Food Busker who commenced his real-time recipe demonstration in The Living Room and then waltzed on through to the Pantry Kitchen with a live audience in tow. For this episode the Food Busker made an Espresso Martini Tiramisu. The ingredients: 400g of natural yoghurt, 400ml of double cream, a tub of mascarpone, 100ml of coffee liqueur, 50ml of vodka, 10 cups of cold espresso (to soak or ‘drop’ sponge fingers into), grated clementine (to add a seasonal twist) and cocoa powder. The Food Busker got members of the audience to come up and act as commis chefs, such as Millie, who helped whisk the creamy ingredients together and Phillip (founder of an app that brings transparency to food labels) who assisted with the layering process (soaking biscuits, adding creamy layer, zesting clementine and sprinkling cocoa powder). The dish was garnished with blitzed up dehydrated orange crisps and dark chocolate coated coffee beans. In needs to be left in the fridge overnight “so that all the ingredients get to know each other,” says Food Busker. Fortunately the Food Busker had pre-prepared another tiramisu the day before, where the ingredients definitely had a chance to mingle. This finger-licking treat was then shared with the audience, who provided their opinion on how much they would pay for a slice. After, the team from Shaken Cocktails divided the audience into groups for a special espresso martini cocktail making class. It was an enjoyable experience with even more enjoyable (read strong) results. 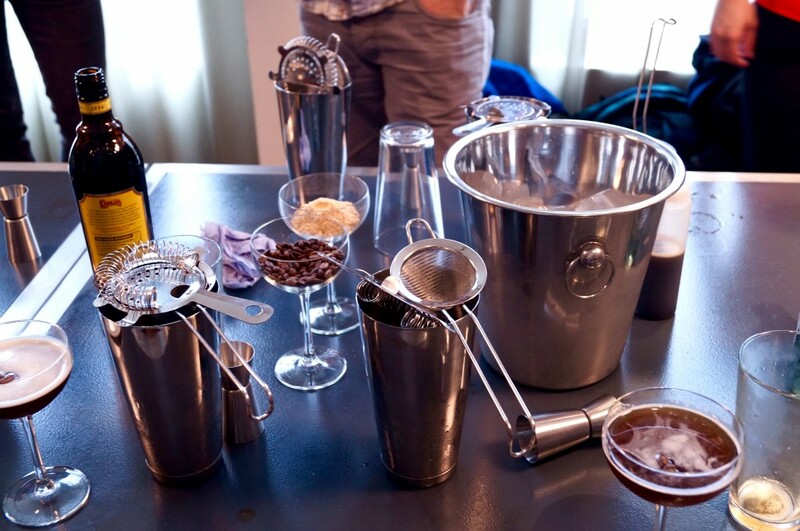 The cocktail startup works by delivering a premium box of ingredients and recipes to your door each month. The boxes come with simple easy-to-follow recipes and tricks, helping you to carve your path to cocktail connoisseurship. Overall it was a lively afternoon complete with film, food, coffee and booze that highlighted how technology can be harnessed to change the way we view food and drinks in the digital space.